Was the Tigers' Player of the Month for June 2016 and June 2018...in 2016 finished second in the American League Rawlings Gold Glove Award voting for shortstops...in 2015, while playing for the Tigers was an American League All-Star...in 2013 finished second in the Baseball Writers' Association of America's American League Rookie of the Year voting...also in 2013 was the Rookie of the Year for both the Red Sox and Tigers as selected by local media, a Baseball America Major League Rookie All-Star and American League Rookie of the Month for June...in 2012 was an International League All-Star...in 2011 and 2012 was rated by Baseball America the best defensive shortstop in the Internationl League...in 2010 was an Arizona Fall League Rising Star and a member of that league's All-Prospects team...was 1 of 6 players born in Cuba who participated in the Reds' 2019 Major League spring training camp, joining RHP Raisel Iglesias, OF Yasiel Puig, RHP Odrisamer Despaigne, RHP Vladimir Gutierrez and IF Alfredo Rodriguez...participates in Autographs for a Cause, which donates money to Miami Children's Hospital Foundation, and the Autographed Memorabilia Donation and Dreams Come True programs. Was the Tigers' Player of the Month for June (.304/.326/.413)...missed all of September with a lower abdominal strain...hit .333 with RISP...following the season became a free agent...on 2/23/19 was signed by the Reds to a minor league contract with an invitation to 2019 Major League spring training camp. Established career highs in doubles (33), home runs (6) and RBI (54) with the Tigers in 2017...Led the team with 13 three-hit games and ranked second on the team (min. 100 at-bats) with a .327 (36x110) batting average with runners in scoring position...Sidelined from April 21-27 with a concussion...Established a career high with four runs scored on June 2 vs. Chicago (AL)...Hit .301 (25x83) with 14 runs scored, six doubles, one home run and 14 RBI in 23 games during the month of July...Drove in a career-best four runs on August 24 vs. New York (AL). Completed his second full season with the Tigers in 2016 and established career highs with 467 at-bats, 57 runs scored, 26 doubles, four home runs, 32 RBI and 28 walks... Led the American League with 10.26 plate appearances per strikeouts, while he was tied for fourth with seven sacrifice hits... Was one of three finalists for the American League Gold Glove as a shortstop, finishing in second...Recorded multiple hits in three straight games from April 6-9 - the streak was tied for the fourth longest of his career and the longest since he had four straight games of two-or-more hits from August 17-21, 2013...Hit his first home run of the season on May 11 at Washington - also homered on June 15 at Chicago (AL), June 28 vs. Miami and July 25 at Boston...Tied a career high with three RBI on May 16 vs. Minnesota (other, July 17, 2015 vs. Baltimore)... Had his career-long errorless streak snapped at 64 games on May 25 vs. Philadelphia... Hit safely in 14 straight games from June 1-16 - hit .388 (19x49) with 12 runs scored, four doubles, one home run and five RBI during the streak... Had a season-high three hits with a double and two RBI on June 22 vs. Seattle...Named Tigers Player of the Month for June after hitting .333 (31x93) with 17 runs scored, eight doubles, two home runs and 10 RBI - ranked tied for fifth in the AL with eight doubles during the month... Hit a walkoff RBI single on July 30 vs. Houston - marked his second career walkoff hit (other, April 17, 2015 vs. Chicago (AL))... Sidelined from August 11-27 with a left hamstring strain... Began an injury rehabilitation assignment with Triple A Toledo on August 22 - played in four games with the Mud Hens and hit .375 (6x16) with two runs scored, a double, a home run and a RBI... Played in 27 games in September/October and hit .297 (27x91) with nine runs scored, nine doubles and five RBI... Hit .255 (85x333) against righties, while he batted .254 (34x134) vs. lefthanded pitchers... Posted a .241 (53x220) batting average at Comerica Park...hit .267 (66x247) on the road... Batted .250 (70x280) with 37 runs scored, 14 doubles, three home runs and 20 RBI before the All-Star break...hit .262 (49x187) with 20 runs scored, 12 doubles, one home run and 12 RBI following the All-Star break. Completed his first full season with the Tigers in 2015 and established career highs in games played (120), at-bats (416), runs scored (44), hits (125), doubles (17), triples (3), walks (25) and stolen bases (11). Selected to the American League All-Star Team for the first time in his career. Stole a pair of bases on Opening Day, becoming just the second Tigers player since 1914 to steal multiple bases on Opening Day, joining Travis Fryman, who stole two bases vs. Oakland on April 5, 1993. Recorded the first four-hit game of his major league career on April 8 vs. Minnesota, finishing the game going 4 for 4 with three runs scored, a double and a walk -- became the first Tigers shortstop to record four hits and score three runs in a game since Ramon Santiago on June 17, 2010 vs. Washington...also had four hits on July 19 vs. Baltimore and August 18 at the Chicago Cubs. Notched the first walkoff hit of his big league career with a RBI single in the ninth inning on April 17 vs. Chicago White Sox. Finished the month of April with a .377 (26 for 69) batting average with seven runs scored, four doubles, two triples, one home run and three RBI. Hit safely in a season-high nine straight games from May 3-18, batting .333 (11 for 33) with one run scored and three RBI during the streak. Posted a .315 (29 for 92) batting average with 15 runs scored, nine doubles, one home run and nine RBI during July. Left the game on September 3 at Kansas City with a right middle finger contusion...missed the rest of the season after a follow-up CT scan on September 9 revealed a non-displaced small chip fracture of the right middle finger at the PIP joint. Hit .354 (35 for 99) against lefthanded pitchers...batted .284 (90 for 317) vs. righthanded pitchers. Posted a .302 (61 for 202) batting average in 59 games at Comerica Park...hit .299 (64 for 214) in road games. Recorded a .327 (49 for 150) batting average in the seventh inning-or-later, while he had a .310 (22 for 71) batting average in close and late situations. Hit .314 (80 for 255) with 19 runs scored, eight doubles, two triples, one home run and 15 RBI before the All-Star break...hit .280 (45 for 161) with 25 runs scored, nine doubles, one triple, one home run and eight RBI following the AllStar break. Sidelined for the entire 2014 season with bilateral tibial stress fractures. Opened the 2013 season with the Boston Red Sox before being acquired by the Tigers on July 30 in exchange for Avisail Garcia and Brayan Villarreal...Led the American League with 35 infield hits, while he was tied for second with 10 bunt hits...Ranked second among all American League Rookies with 106 hits, and 31 multi-hit games, while he was sixth with 39 runs scored...Established a career-high 27-game on-base streak from May 24-June 25...Compiled a career-high 18-game hitting streak from May 27-June 18, batting .462 (18x39) during that stretch...Named the American League Rookie of the Month for June after batting .395 (34x86) with four doubles, two triples, one home run and 17 runs scored in 25 games during the month...Hit .294 (25x85) with one home run and five RBI in 27 games during July...Batted .294 (37x126) with lefties on the mound...hit .308 (69x224) against righties...Batted .367 (66x180) in 52 games prior to the All-Star break...batted .235 (40x170) in 57 games after the break...Appeared in 11 postseason games for the Tigers... batted .357 (5x14) against the Red Sox in the American League Championship Series...Finished second in voting conducted by the Baseball Writers' Association of America for the American League Rookie of the Year Award. Played in a career-high 25 games over 2 stints with BOS, his 2nd straight season withmajor league experience.Did not appear in his 1st stint with the Sox from 5/1-3...Remained in the majors after a 8/25 recall to Boston.At 22 years old, was the youngest player to appear in a game for the Red Sox for the 2nd straight year.Made 24 appearances at shortstop and entered 1 game at DH...All 23 starts came in the Red Sox' final 33 games beginning 8/28.Reached in 5 straight games from 9/17-21 (4-for-14, 2 BB, HBP) and scored at least once in 4 straight contestsfrom 9/17-20 (5 total runs).Collected 1st career homer, RBI, and multi-hit effort as a major leaguer on 9/20 at TB, going 3-for-4 with 2runs...At 22 years, 259 days old, was 1st BOS infielder under 23 years old to homer since 21-year-old Wilton Veras on 7/9/99 and the 1st Sox shortstop under 23 years old to do it since 22-year-old Rey Quinones on 6/4/86.Went hitless in his 1st 17 at-bats of the year with BOS prior to a 5th-inning double on 9/3 at SEA.Named a 2012 post-season International League All-Star after batting .266 (94-for-353) in 88 games forTriple-A Pawtucket...Topped the PawSox with 9 sacrifice hits and tied for 3rd on the team with 12 stolen bases in 15 attempts...At the time of his 8/25 promotion, was tied for 2nd on the club in hits.Was 4th-toughest International Leaguer to strike out, fanning once every 8.61 plate appearances (396 PA/46 SO).Led the PawSox with a .341 AVG in May (28-for-82) before missing from 5/25-6/25 on the DL...Played 2games with Short-A Lowell on rehab, going 3-for-8 (.375).Hit safely in 14 of his last 16 Triple-A games from 8/4-24, ranking 5th in the IL with a .371 AVG (23-for-62) inthat time...Topped the club and ranked 7th in the circuit with a .329 clip (24-for-73) in August overall.Named the top defensive shortstop in the International League by Baseball America for a 2nd straight season...Also ranked as the top defensive infielder in the Sox system by BA for a 4th straight year. Saw his 1st Major League action in 10 games with Boston in his 1st full season in theU.S...Played the rest of the year at Triple-A Pawtucket...Played in 10 Major League games overall and went 2-for-6 (.333) with 3 runs scored...Appeared in 8 games atshortstop, including 1 start (5/11 at TOR), and made 5 appearances as a pinch-runner...Recalled on 5/8 and made Big League debut that day as defensive replacement at shortstop in the 9th inning.....At 21 years/123 days old, was the youngest Red Sox player to appear in a game since Jeff Suppan at21 years/94 days on 4/5/96 at KC...Also the Sox youngest position player in a game since Rich Gedman at21 years/9 days on 10/5/80 vs. TOR and the club's youngest at shortstop in a game since Juan Beniquez at 21years/118 days on 9/13/71 vs. NYY...His 1st Major League run scored was the winning tally on Carl Crawford's walk-off, 11th-inning double on 5/9vs. MIN...Pinch-ran for Jed Lowrie prior to the double...Was optioned back to Triple-A Pawtucket on 5/20...Was recalled again on 9/13 and remained in the Majors forthe duration of the season, hitting safely in both at-bats during that stretch...Recorded his 1st Major League hiton 9/15 vs. TB, a single off Alex Torres...Spent most of the season with the PawSox, appearing in 101 contests...Batted .235 (84-for-357) with 9 doubles,1 homer, 31 RBI, 35 runs, 21 walks and 12 stolen bases...Hit safely in 10 of his last 12 regular season games with Pawtucket from 8/24-9/5, batting .333 (13-for-39)...Led qualifying Triple-A shortstops with a .973 fielding percentage (12 errors), 441 total chances and 284 assistsin 97 games at shortstop...Started all 3 of Pawtucket's playoff games in the International League semi-finals against Lehigh Valley. Made professional debut with Double-A Portland but limited to 57 games due to abroken right hand.Entered the 2010 campaign rated as the No. 9 prospect, No. 7 position player, in the Sox system according toBaseball America...Also named as the organization's Best Defensive Infielder in the publication's Best Tools survey.Collected season-high 5 RBI in the Sea Dogs 7-2 win vs. Binghamton on 5/11...Was 3-for-5 with a triple in the game.Suffered a broken right hand when he was hit by a pitch on 5/29 vs. New Britain and placed on the disabledlist on 6/4...Was hitting .306 (45-for-147) with 9 doubles, 3 triples, 9 RBI and 19 runs scored before the DL stint.Played in 13 rehab games with Short-A Lowell from 7/31-8/15, hitting safely in 11 of the 13 contests for a.350 overall clip (14-for-40)...Served as the designated hitter in 11 games and played shortstop twice.Activated from Portland's DL on 8/17...Hit .243 (18-for-74) with a double, 4 RBI and 10 runs to finish the year.Appeared at shortstop in 55 games overall with the Sea Dogs, posting a .966 fielding percentage (7 E/203 TC).Named Best Defensive Shortstop in Double-A by Baseball America in a list released near the end of the season.Played in the Arizona Fall League for the 2nd straight year...Hit .269 (18-for-67) with 1 double, 8 RBI, 7 runsand 4 stolen bases in 17 games with the Peoria Javelinas...Appeared at shortstop in all 17 tilts. Played for the Mesa Solar Sox in the Arizona Fall League...Batted .275 (19-for-69) with 4 doubles, 2 home runs, 12 RBI, 9 runs, 4 walks and 3 stolen bases in 18 games with Mesa...Selected to play in the league's Rising Stars Game (0-for-2). March 28, 2019 Cincinnati Reds selected the contract of SS Jose Iglesias from Louisville Bats. February 23, 2019 Cincinnati Reds signed free agent SS Jose Iglesias to a minor league contract and invited him to spring training. 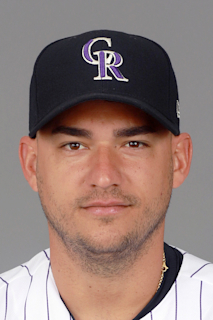 February 23, 2019 SS Jose Iglesias assigned to Louisville Bats. October 29, 2018 SS Jose Iglesias elected free agency. October 29, 2018 Detroit Tigers activated SS Jose Iglesias from the 60-day disabled list. September 14, 2018 Detroit Tigers transferred SS Jose Iglesias from the 10-day disabled list to the 60-day disabled list. Lower abdominal strain. August 30, 2018 Detroit Tigers placed SS Jose Iglesias on the 10-day disabled list. Lower abdominal strain. September 9, 2017 Detroit Tigers activated SS Jose Iglesias from the paternity list. September 6, 2017 Detroit Tigers placed SS Jose Iglesias on the paternity list. August 9, 2017 Detroit Tigers activated SS Jose Iglesias from the bereavement list. August 6, 2017 Detroit Tigers placed SS Jose Iglesias on the bereavement list. April 27, 2017 Detroit Tigers activated SS Jose Iglesias. April 21, 2017 Detroit Tigers placed SS Jose Iglesias on the 7-day disabled list retroactive to April 20, 2017. Concussion. August 27, 2016 Detroit Tigers activated SS Jose Iglesias from the 15-day disabled list. August 22, 2016 Detroit Tigers sent SS Jose Iglesias on a rehab assignment to Toledo Mud Hens. August 12, 2016 Detroit Tigers placed SS Jose Iglesias on the 15-day disabled list retroactive to August 11, 2016. Strained left hamstring. October 31, 2014 Detroit Tigers activated SS Jose Iglesias from the 60-day disabled list. August 2, 2013 Detroit Tigers activated SS Jose Iglesias. May 24, 2013 Boston Red Sox recalled Jose Iglesias from Pawtucket Red Sox. April 9, 2013 Boston Red Sox optioned Jose Iglesias to Pawtucket Red Sox. August 25, 2012 Boston Red Sox recalled Jose Iglesias from Pawtucket Red Sox. June 26, 2012 Jose Iglesias roster status changed by Pawtucket Red Sox. June 22, 2012 sent SS Jose Iglesias on a rehab assignment to Lowell Spinners. May 3, 2012 Boston Red Sox optioned SS Jose Iglesias to Pawtucket Red Sox. May 1, 2012 Boston Red Sox recalled Jose Iglesias from Pawtucket Red Sox. March 27, 2012 Boston Red Sox optioned Jose Iglesias to Pawtucket Red Sox. September 13, 2011 Boston Red Sox recalled Jose Iglesias from Pawtucket Red Sox. July 21, 2011 Jose Iglesias roster status changed by Pawtucket Red Sox. July 6, 2011 Pawtucket Red Sox placed SS Jose Iglesias on the 7-day disabled list retroactive to July 4, 2011. May 20, 2011 Boston Red Sox optioned SS Jose Iglesias to Pawtucket Red Sox. May 8, 2011 Boston Red Sox recalled Jose Iglesias from Pawtucket Red Sox. March 17, 2011 Boston Red Sox optioned Jose Iglesias to Pawtucket Red Sox. October 13, 2010 Jose Iglesias roster status changed by Boston Red Sox. August 31, 2010 Jose Iglesias assigned to Peoria Javelinas. August 17, 2010 Jose Iglesias roster status changed by Portland Sea Dogs. July 31, 2010 sent SS Jose Iglesias on a rehab assignment to Lowell Spinners. June 6, 2010 Portland Sea Dogs placed SS Jose Iglesias on the 7-day disabled list retroactive to June 4, 2010. March 14, 2010 Boston Red Sox optioned SS Jose Iglesias to Portland Sea Dogs. October 19, 2009 Jose Iglesias roster status changed by Boston Red Sox. October 1, 2009 SS Jose Iglesias assigned to Mesa Solar Sox. September 8, 2009 Boston Red Sox signed free agent SS Jose Iglesias.